The Margaritaville resort at Lake Conroe. 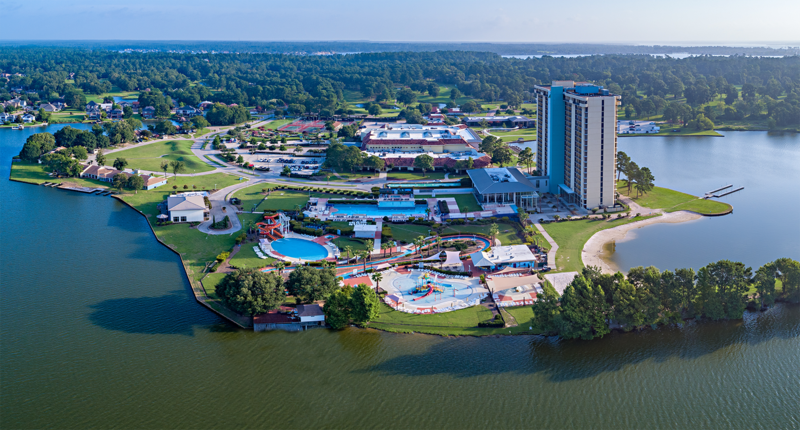 CONROE – (Realty News Report) – A 186-acre Lake Conroe resort, with a 20-story hotel, will open next year bearing the “Margaritaville” brand. A descendent of singer Jimmy Buffett’s No. 1 hit record from 1977, the Margaritaville brand has popularized a casual dining chain, tropical footwear, beach furniture, key-lime pie mix and resort properties. The Lake Conroe Margaritaville will be the results of a major redevelopment of the La Torretta Lake Resort. The resort was acquired by Atlanta-based Songy Highroads and the Wampold Cos. of Baton Rouge. Gensler is designing the redevelopment, scheduled for completion in the third quarter of 2020. Located west of Interstate 45 about 50 miles from downtown Houston, the waterfront property is just north of Highway 105. The 360-room resort will have an 18-hole golf course, tennis facilities, a spa, outdoor pools, 45,000-SF of meeting space and two Margaritaville-branded restaurants – LandShark Bar & Grill and 5 O’Clock Somewhere Bar & Grill. Benchmark Global Hospitality will serve as resort manager. The Lake Conroe resort will be the first in Texas for the Margaritaville organization, which has 17 hotels, two gaming properties, and 60 food and beverage venues. Songy Highroads, led by David Songy, is well known in Houston, where it recently developed the Hyatt Regency Galleria and the Hyatt Place hotel in the Uptown area. Jimmy Buffett, successful in business and on-stage, along with his Coral Reefer Band will play at the Cynthia Woods Pavilion in The Woodlands on June 1.